I can't believe it's been 10 days since my last post...bad liz, bad! Well, I'm taking a few days off, so hopefully I can post all the swatches and looks I've done within the last month. 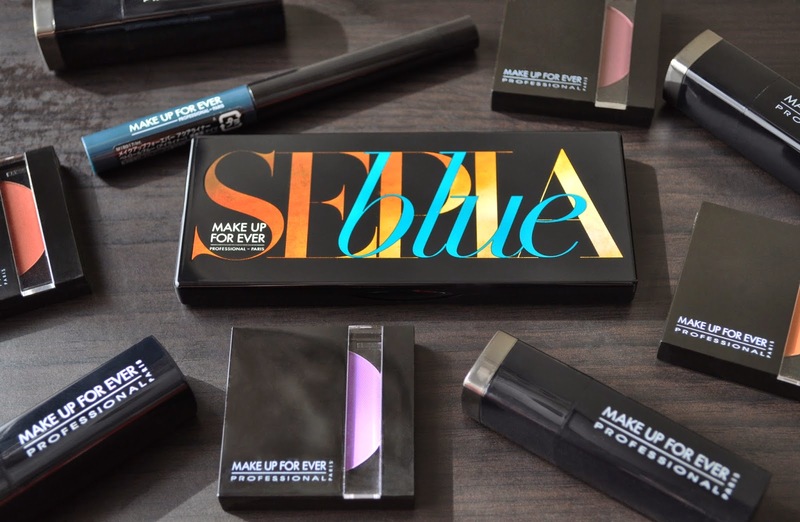 Make Up For Ever's Fall 2013 Blue Sepia Collection was an extremely modest release. The collection featured the Blue Sepia Palette (LOVE my sepia tones), an Aqua Liner in the collection's focal shade, Petrol Blue, and a pair of half falsies decorated with Swarovski turquoise rhinestones (the false eyelashes stayed at the counter). The Blue Sepia palette is truly gorgeous! 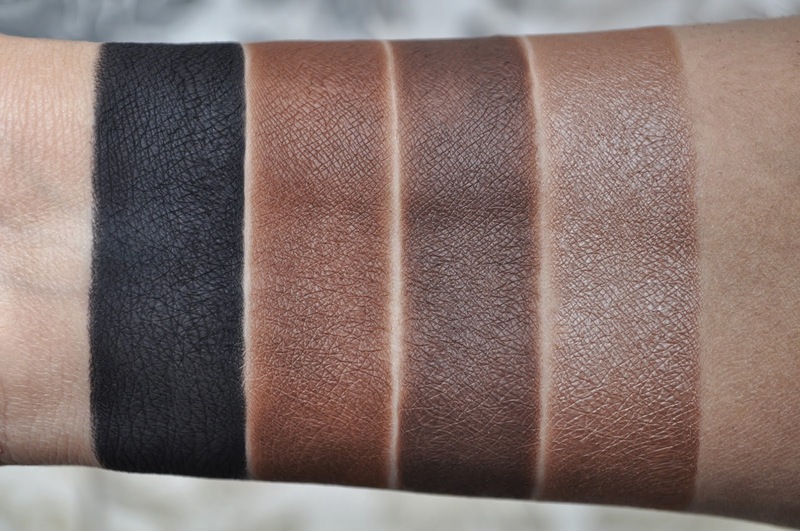 Offering five shades of brown (three matte and two satin), a shimmery, pale pinkish-white, a shimmery, electric, deep turquoise with micro turquoise shimmers and a golden sheen, and a matte black. All six shadows are creamy, extremely pigmented (even with a primer, the deep turquoise shade can/will stain the lids), and amazing in quality. Also, based on your color preference, the three matte brown shadows can be used on the brows...bonus! From left to right: 128, 28 (apparently 28 reacted to moisturizer I was wearing, and darkened), 152, Petrol Blue. From left to right: 04, 98, 17, 127. 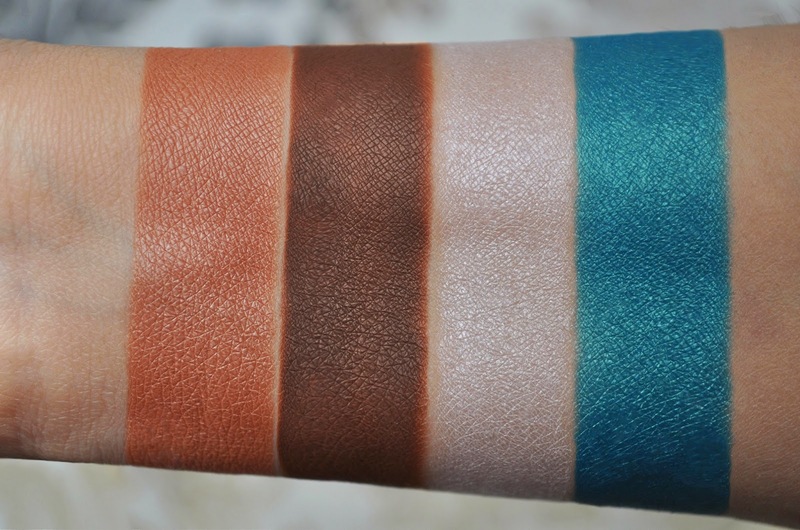 The next two pictures are swatches of the Aqua liner from the collection, as well as the other products used in the looks for the Blue Sepia Palette. 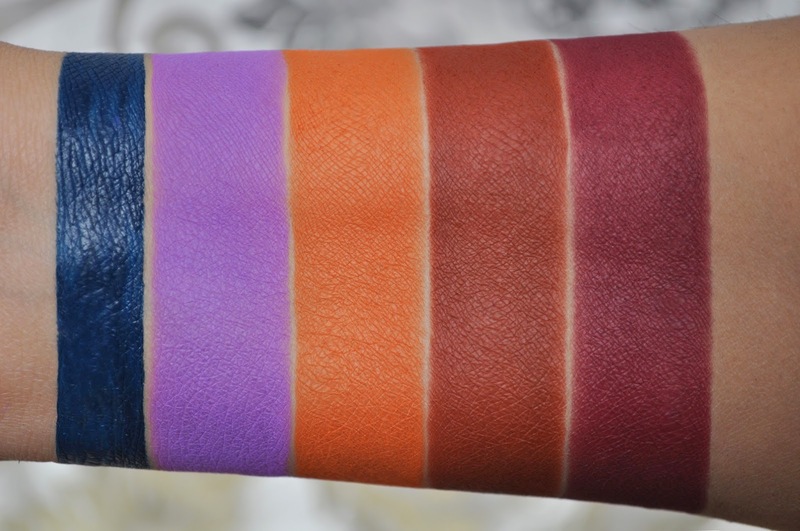 From left to right: Petrol Blue Aqua Liner, Matte Eye Shadow in 09 Lavender, 50 Pumpkin, 161 Cinnamon, Satiny Eye Shadow in 131 Dark Red. 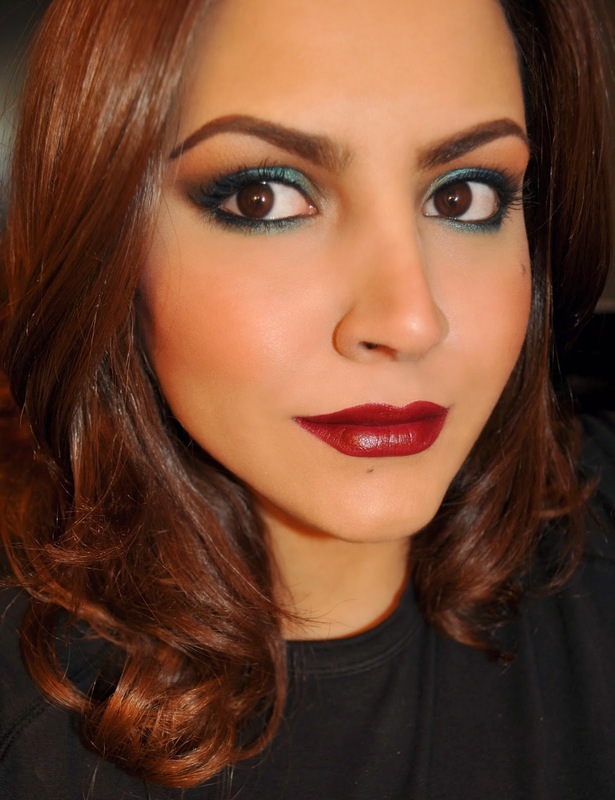 I loved, loved, LOVED the makeup from the promo look of the Blue Sepia Collection. Inspired by the image, I wore (and loved) the Petrol Blue Aqua Liner on the brows (I thought I took a photo of me wearing it, but nein). WARNING: as much as you love the eye-popping effect of Petrol Blue on the brows, the product is INSANELY pigmented, and will stain the skin. So, unless you plan on doing a J.D. Salinger, and being a total recluse the next day, or don't mind the 24-hour faded blue tattoo look, use at your own caution. 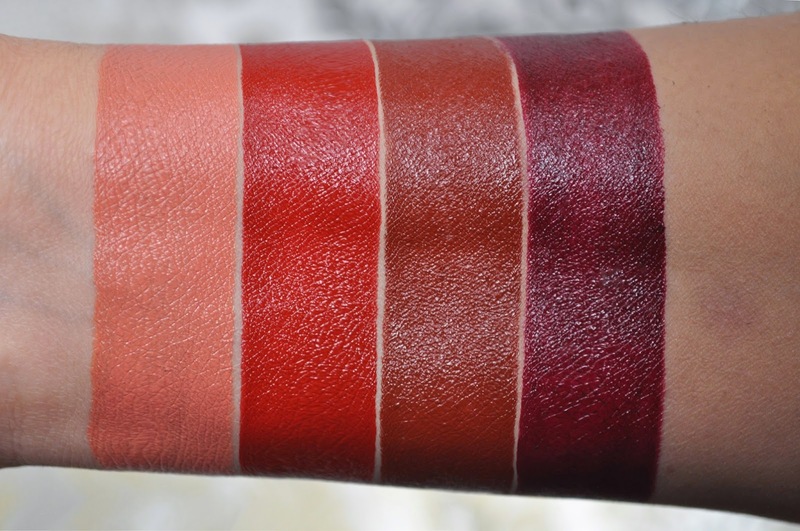 From left to right: Rouge Artist Intense Lipstick: 24, 41, 47, 48. Make Up For Ever Matte Eye Shadow in 50 Pumpkin. MAC Studio Sculpt Concealer in NW20 (under the eyes and on the lid up to the brow bone). 127 shadow (all over the lid and lower lashline). 17 shadow (in the crease and the outer one-third of the lower lashline). 152 shadow (applied lightly in the inner corner and brow bone). Petrol Blue shadow (in the outer corner of the lower lashline). Make Up For Ever Aqua Liner in Petrol Blue (the upper lashline). Make Up For Ever Rouge Artist Intense Lipstick in 41 (use a lip brush to line the lips with the lipstick and then fill them in by dabbing). Make Up For Ever Matte Eye Shadow in 09 Lavender (much more lavender in person). 28 shadow (all over the lid and lower lashline). 128 shadow (in inner corner and used to blend-out the crease). 04 shadow (used to line the upper lashline). Make Up For Ever Rouge Artist Intense Lipstick in 47 (use a lip brush to line the lips with the lipstick, fill with the tube, then rub with a finger). Make Up For Ever Matte Eye Shadow in 131 Dark Red (much more lavender in person). Petrol Blue shadow (all over the lid and lower lashline). 98 shadow (in the crease and outer corner). 04 shadow (in the outer corner patted over the 98 shadow, used to line the upper lashline and corner of the lower lashline). Urban Decay 24/7 Glide-On Eye Pencil in Zero (used to tightline and on the waterline). Make Up For Ever Rouge Artist Intense Lipstick in 24. Mac Lip Conditioner (place on top of the lipstick). 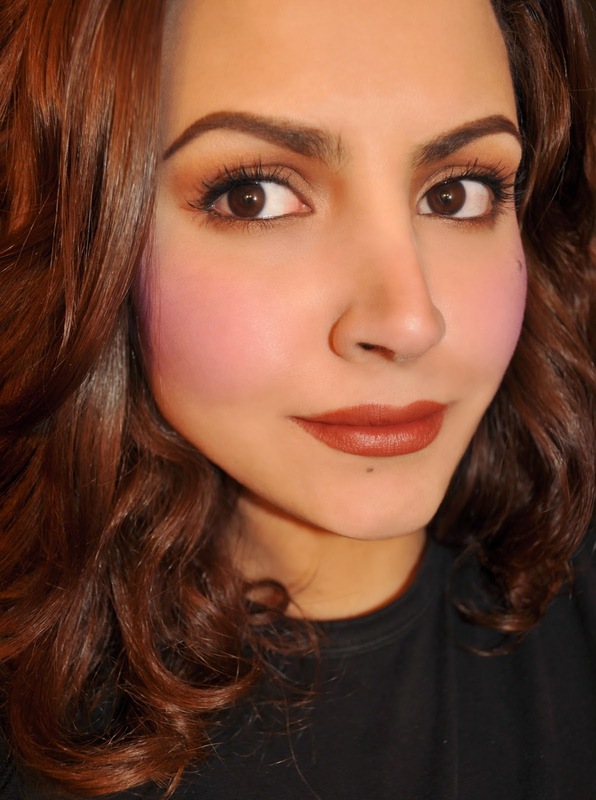 Make Up For Ever Matte Eye Shadow in 161 Cinnamon. Petrol Blue shadow (placed on the center of the lid and lower lashline). 98 shadow (in the outer corner of the lid and blended half way into the crease). 28 shadow (in the inner corner of the lid and blended halfway into the crease). 128 shadow ( used in the crease to blend out the edges of 98 and 28, applied up to the brow bone). 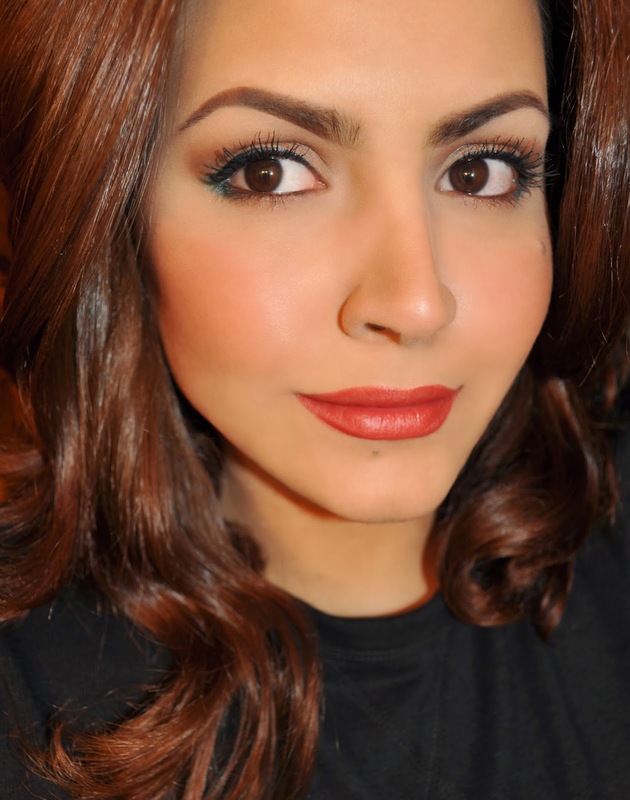 04 shadow (in the outer corner and patted closely along the lashes of the lower lashline ). 152 shadow (inner corner and in the arch of the brow bone). Make Up For Ever Aqua Liner in Petrol Blue (the upper and lower lashline). Make Up For Ever Rouge Artist Intense Lipstick in 48. Did you pick anything up for the Blue Sepia Collection? Wow, Liz! The variety of looks & your creativity is so amazing. PLEASE TEACH ME YOUR WAYS! Petrol Blue is so complex & so pretty on you. If you can find the palette and liner, get them! SUCH A GORGEOUS LOOK! I love the teal in this palette, it's the perfect bold pop against all of those saturated neutral shades! You look amazing in these pictures. Thank you Remychic <333 I was really inspired by the palette.